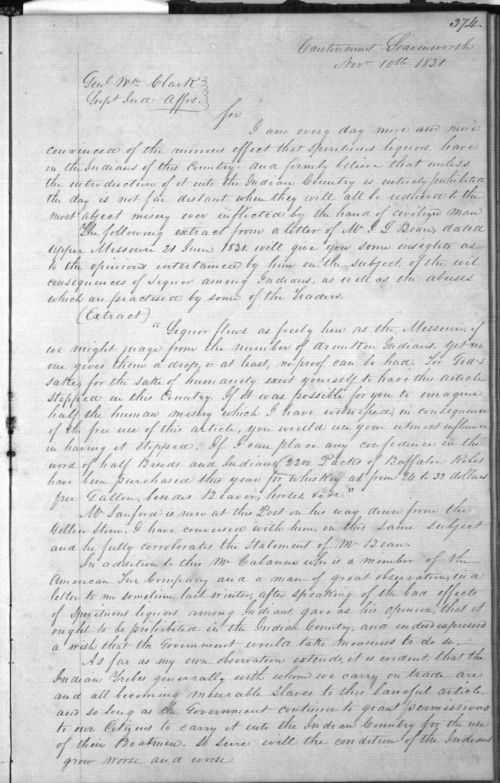 John Dougherty wrote this letter from Fort Leavenworth to the Superintendent of Indian Affairs, William Clark (of Lewis and Clark fame). As Indian agent in Kansas Territory, Dougherty had seen the effect that hard liquor had on the local Indian tribes, and he believed that it should not be allowed into the territory. To back up his position he included a copy of a letter by J. L. Bean. Because this letter vividly demonstrates the harmful effects of white contact with native peoples (including the use of hard liquor), it could be grouped with a number of documents relating to Indian assimilation into white culture. It would also work with the September 22, 1830 letter from the William Clark Papers that has also been selected for this standard.